I love making lists. They’re easy to make, they help you stay organized, and they make for a great addition in any art journal. Whether you want to make an entire book of lists, or just include a list on an art journal page or two, you’ll find these list prompts to help inspire you to create! We’ve made a list of lists you can make and incorporate into your journaling projects. 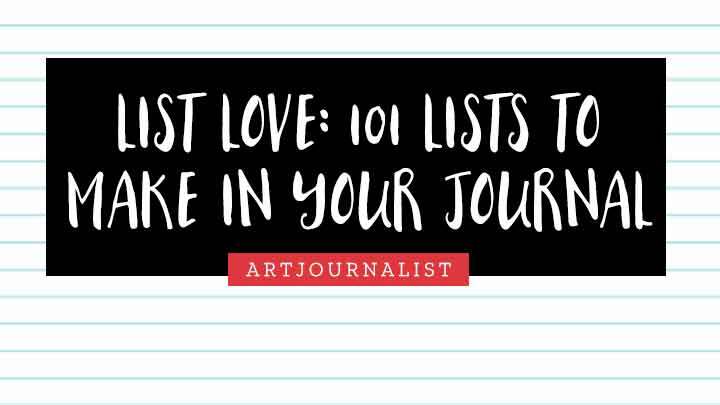 There’s over 100 ideas of lists to make! This list of lists is sure to keep you inspired for many, many projects to come! 1. A to Z List: Make a list of something from A to Z. It could be a list of things you want to do, or a list of things that inspire you. 2. Words You Like List: What words inspire and motivate you or just plain out make you feel good? Making a list of 10 or 100 words can be a great art journal prompt. 3. Favorite Movies: What movies do you love? Create a page inspired by your favorite movies. 4. Favorite Songs: I love music, so making lists of songs is pretty simple for me! You could make a list of songs that make you happy, songs that make you sad, songs that remind you of a person in your life, songs that help you fall asleep. What’s on your playlist? Use that as inspiration! 5. List of Places: You could make a list of your favorite places to go, places you’ve traveled to, or places you would like to travel to, or places you have lived. 6. List of Foods: What are some of your favorite foods to eat or cook? 7. Clothes List: List everything in your closet, or just what you’re wearing for today or some of your favorite outfits to wear. 8. Make a Currently List: What are you reading, watching, listening to, eating, needing, wanting, and missing right now? 9. The To-Do List: Do you have a never ending to-do list? Don’t be afraid to include your to-do lists in an art journal. 10. Things to Try List: What are some things you would like to try? Maybe you’ve got a zillion things on Pinterest awaiting you, or maybe there’s something new you’re interested in learning and doing. 11. Goals List: What are your goals for this week? The next month? The next year? The next five years? Art journaling about your goals can help bring them from idea to reality! 12. Your Thankful List: What are you thankful for? Creating a list of things you are thankful for can help you appreciate even the smallest things. 13. Makes Me Happy List: What Makes you Happy? Make a list of things in your life that bring you joy. 14. Makes me Sad List: Knowing the things that make you sad can help you understand yourself better as well as can make for some interesting art. 15. Shopping Lists: Shopping lists might not sound like the most exciting thing, but it can be interesting to see what’s on your “to-buy” list in your art journals. 16. Childhood Memories List: What are some of the things you remember from being a child? What things remind you of being a child? 17. Quotes List: What are some of your favorite quotes? 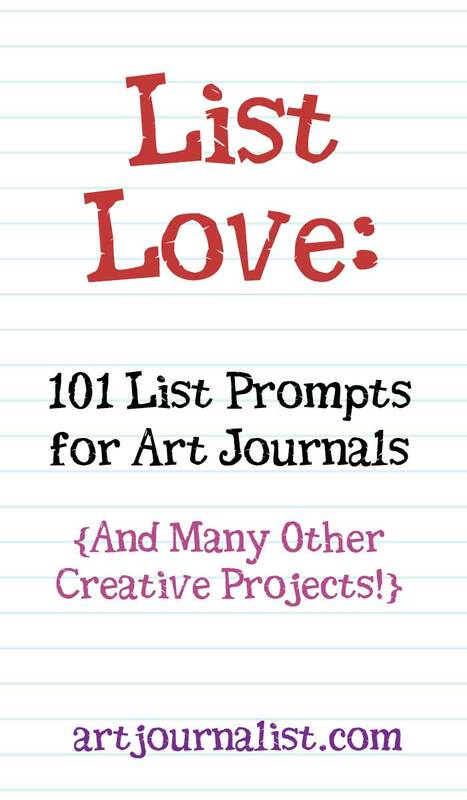 Create a list of them on your art journal page. If you have many, many favorite quotes, consider breaking them up into different categories, ie: favorite love quotes, favorite sad quotes, favorite inspirational quotes. 18. Best Decisions You’ve Ever Made List: Each day we make hundreds of decisions, from what to eat for breakfast to what to wear for the day. Sometimes we make big decisions too – like moving somewhere new or changing your lifestyle habits. Make a list of 5 or 10 best decisions you’ve ever made. 19. Things I’d Rather Be Doing List: What would you rather be doing instead of what you’ve been doing? Make a list of things you would like to do all the time. 20. List of Firsts: Your first kiss, your first date, your first job, your first drive, your first teacher, your first concert, the first thing you do in the morning…making a list of firsts can be very interesting! 21. Rainy Day Ideas List: What can you do on a rainy day? Make a list of things you can do for fun or to relax while the raindrops patter on the windows. 22. Books List: What are you reading lately? What are some of your favorite books of all time? What’s on your “to-read” list? 23. Wishlist: What things are on your wishlist? 24. Talents/Strengths List: Make a list of things you are very talented at or some of your strengths. Not only is this a great topic for an art journal page, but it will make you feel good about yourself too! 25. If I Ruled the World List: What would you do if you ruled the world? Make a list of the things you’d do differently or change. 26. Bucket List: What’s on your bucket list? What are things you’d like to do before a certain milestone in your life? 27. Ought to Do List: Are there things you should do but don’t want to do? You can make a list of chores or tasks you don’t feel like doing but should do. 28. Daily Life List: What do you do on an average day? Make a list of your usual activities you do each day. 29. Someone You Admire List: Make a list of people you admire and look up to. Or, additionally/alternatively, make a list of the characteristics of someone you admire. 30. Ways to Relax List: Make a list of what relaxes you and helps you feel calm. 31. List of Things You Find Beautiful: What do you find beautiful? Make a list of things where you see beauty. 32. Inside Your Bag List: What do you keep inside your purse or briefcase or other bag you carry around with you each day? No bag? How about your pockets or what you keep in your car? 33. List of Advice: Make a list of the advice you’ve received over the years, or list advice you wish you could give yourself or others. 34. List of Things You Are Proud Of: What makes you feel proud for accomplishing or doing? 35. The Never List: What are things you’ve never done? Or things you know you never will do? 36. Website Lists: Make a list of all your favorite websites and websites you visit the most often or sites you have bookmarked. 37. List of Things You Collect: Do you collect items? 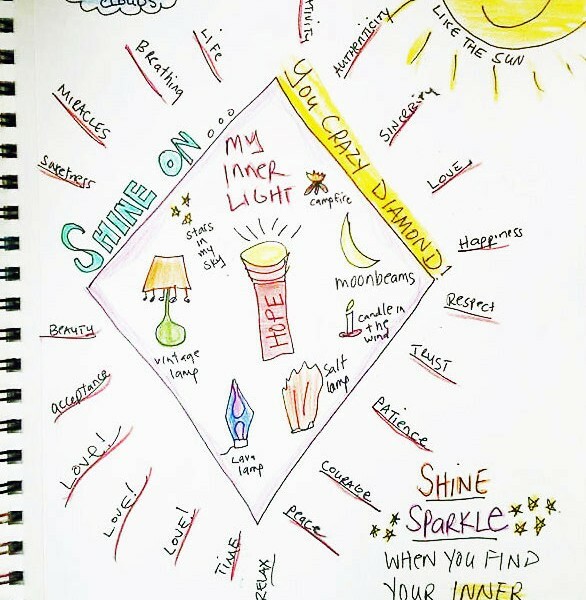 Whether its for art journaling, or for another purpose, make a list of things you’ve collected. 38. List of Things You Own: What things do you own? Make a list of your possessions. 39. List of Things In Progress: Do you have projects that are in progress or an aspect of yourself you are working on? Make a list of “in progress things”…and it might just help you to finish some of them! 40. List of Questions: Are there questions you have about life that you don’t know the answers to? Make a list of all the questions you have – they can be silly or as serious as you want them to be. 41. List of Fears: What are you scared of? Making a list of fears can help you overcome some of these. 42. Reasons Why List: Make a list of the reasons why you love/hate something. Or Reasons why you’re glad you did something. 43. List of Things You Are Looking Forward To: What are some things that you are looking forward to in the next few days, weeks, month, or year? 44. List of Funny Things That Have Happened to You: What are some things that have happened to you that you can laugh about now? 45. Things That Remind You of Home: What reminds you of home? 46. List of Things You Need to Survive: What couldn’t you survive without? What things do you need to have to live? 47. Things You Know: Make a list of all the things you’ve learned or know. 48. Packing List: What do you pack when traveling? 48. List of Inside Jokes You Have: Have a joke only you and someone else understand? Make a list of these so you’ll remember them for later. 49. If I Were a Zillionaire: What would you do if you had zillions of dollars and could spend money with reckless abandon? 50. Fictional Places You Wish You Could Visit: Whether they be from books, movies, or your own imagination, what are some imaginary places you’d like to visit? 52. List of Names You Like: Whether you’re naming future kids, pets, or your household items…there are some really cool names out there worthy of making a list about! 53. Pet Peeves: Make a list of some of your pet peeves. What really drives you nuts? 54. List of Jobs You Think You Might Enjoy: Even if you aren’t thinking about a career change, it can be fun to think of other jobs you might enjoy. 55. Things to Do When You’re Bored: Make a list of things to do when you’re bored. 56. List of Things to Put in Your Art Journal: I like to keep a list of art journal techniques and ideas in my book as it always gives me inspiration whenever I’m in need of an idea. 57. The Best Parts of Today…: Make a list of all the best parts of today! Remember: It’s those little moments in life that matter the most! 58. Favorite Games List: Whether it’s cards, board games, video games, or computer games, make a list of all your favorites. 59. List of Things You Would Do If You Had More Time: There’s simply not enough time in the day, is there? What would you do if you had a few extra hours in the day? 60. List of Colors: You can make a list of all your favorite colors, made-up names you have for colors, or list things that are a certain color (IE: 25 Things That I Love That Are Red). 61. Things to Do When You Are Sad: What helps you feel better when you’re feeling blue? This can be an uplifting list to make and a great one to reference to when times get tough. 62. List of Favorite Smells: What smells do you love? Whether it’s vanilla scented candles or the smell of coffee in the morning or the smell of a fresh spring rain…make a list of all the things you love for a little aromatherapy. 63. How to Be Happy List: Make a list telling someone how to be happy. 64. List of Promises to Yourself (Or Someone Else): What things can you promise yourself (or someone else) to do? 65. List of Things That Changed Your Life: It could be as simple as a book or meeting a certain person…what has changed your life for the better? 66. Reasons Why You Love The Seasons: Do you love winter, spring, summer, or fall? Make a list of why you love these seasons. 67. Random Facts About Me List: Make a fact sheet all about you! List 10-100 random things about you that help define who you are. 68. List of Things to Photograph: Do you like photography? Make a list of things you would like to take pictures of. 68. List of Places to Visit In Your City: Chances are there are some great places to visit in your city – make a list of where you would recommend a visitor to visit, whether it be historical landmarks, parks, or restaurants. 69. Creativity List: Make a list of all the things that help you stay creative. This can be a great thing to reference later when you need a spark of creative inspiration to break out of a rut! 70. Dream Home List: What would you like your dream home to be like? 71. Overheard Conversations List: What conversations have you overheard? 72. List of Things To Do With Someone You Love: Make a list of things to do together with someone you love – date night ideas for example. 73. List of Favorite Magazines: What are some of your favorite magazines to read (or in the case of most art journalists…cutting up, lol)…make a list of magazines you’d like to read. 74. Favorite Artists List: Who’s artwork inspires you the most? Make a list of all your favorite artists. 75. Things People Say: Make a list of the things your kids or spouse or friends or family members say. 76. Sick Day List: What things do you like to do when you’re sick? 77. List of Words That Describe You: How do your friends and family describe you? What words do you use to describe yourself? 79. Favorite Snacks: Make a List of Your Favorite snacks to munch on. 80. List of Book Titles: What topics could you write a book about? Make a list of possible book titles. 81. List of Inventions You Wish Existed: What inventions do you wish existed that would make your life easier? 82. List of Business Ideas: Make a list of possible business ideas you could do using your current interests or talents. 83. List of Things to Remember: What are things you should remember? Whether they’re life lessons or simple tips, make a list of the things you know you don’t want to forget. 84. The Worst Movies: Earlier we made a list of the best movies, now what are some of the worst? 85. List of Things You Wish You Could Hire Someone to Do For You: Like to delegate? Make a list of people you wish you could hire. 86. Most Embarrassing Moments: Make a list of the things that have happened to you that were embarrassing. 87. Made Up Words List: Do you make up your own words or use words for things that are uncommon? Make up a list of your favorite made up words you use. 88. What I Learned Today List: Everyday is full of opportunities for learning something. What did you learn today? 89. Things You Didn’t Plan: Life is full of unexpected surprises. What good things have happened in your life that you didn’t plan? 90. List of Things You’ve Searched Online: What have you searched online for answers for in the past few days? 91. Worry List: Experts say you should plan your time to worry so you don’t stay up all night worrying. Makes sense to me! Make a list of the things you worry about – and save yourself from worrying about it later. 92. Events List: Make a list of special events, whether it be birthdays, anniversaries, or obscure holidays like Wear Brown Shoes Day. 93. Flowers and Plants List: What are some of your favorite flowers and plants? 94. Time Wasters: Make a list of your favorite ways to waste time. 95. Manifesto List: What are some words and phrases to live by that are part of your life’s manifesto? Make a list of sayings to live by. 96. List of Things You Love to Touch: What things feel good against your skin? Make a list of things you love to touch. 97. Dreams List: What are some of the dreams you have and hope for yourself or your kids/friends/relatives? 98. List of Healthy Things: What makes you feel healthy, or what do you want to do to be healthier? 99. List of House Rules: What are the rules of your house? 100. DO’s and DON’Ts List: What are the DO’s and DON’Ts to live by or tips for doing something you know a lot about? 101. List of Favorite Poems: Do you like poetry? What are your favorite poems? You are sure to find something you will enjoy to use as journaling inspiration to spark your creative muse! Let’s Connect! Join Our FREE Facebook Community! Are you creating fun things with these ideas for list prompts and list ideas? Join us in our Facebook Community Group to share your creations, find inspiration, ask questions, and connect with a wonderful, supportive community of artists and creatives of all types! I hope you enjoy this “list of lists” and it will help inspire you to create some great lists in your journals! Do you have any other lists ideas? Share them in the comments section below! Many thanks, I will use some of these prompts for my “personal memoirs” books that I will make with the nursing home residents and their families. Regardless, I love it and I’m printing out a copy to use for “daily journal entries when you don’t know what else to write.” Thanks so much for posting this! I loved this list. Thank You. This is a great list! A list of lists 🙂 I just started my webpage so this is going to help me out with my writers block. Thank you for taking the time to put this together. Some great ideas Thank you. Thinking of all of this is sure to get me cleaning as I list! Multi functional listing!! Just discovered your blog! Excited to learn more about keeping an art journal. Is there anyway to print your prompt lists? So very helpful! I love this list! What a great way to express ourselves and offer a peek into our souls. I found it! Worth signing up twice for ???? A complete list. Thank you. Great list! I love making lists, but I usually just keep the lists on my phone (in the Notes app). However, I definitely see the benefit of writing them down in my journals. Thanks Erica! I am definitely a List-Brained Thinker™ lol…I keep lists everywhere, though I do love journals sometimes the digital version is more practical! My favorite app on my phone and laptop for making lists is Workflowy. It’s so easy to make lists that way!